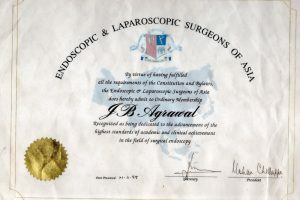 Dr J B Agrawal founded the Agrawal Institute of Laparoscopic Surgery (AILS) with the aim to establish high quality treatment protocols, education and research in the field of Laparoscopic Surgery. Through AILS, Dr J B Agrawal channels his towering experience to train younger surgeons to perfect their skills at laparoscopic surgeries. He also uses this platform to educate patients in making informed choices about their course of treatment..
At AILS Mumbai, Dr Agrawal performs all surgeries himself to ensure personal attention and top quality outcomes for each patient. 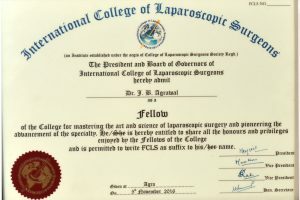 At the same time, he imparts the right techniques to young surgeons from all over India who visit AILS for obesrvership so that they may offer safe laparoscopic surgeries to their patients. 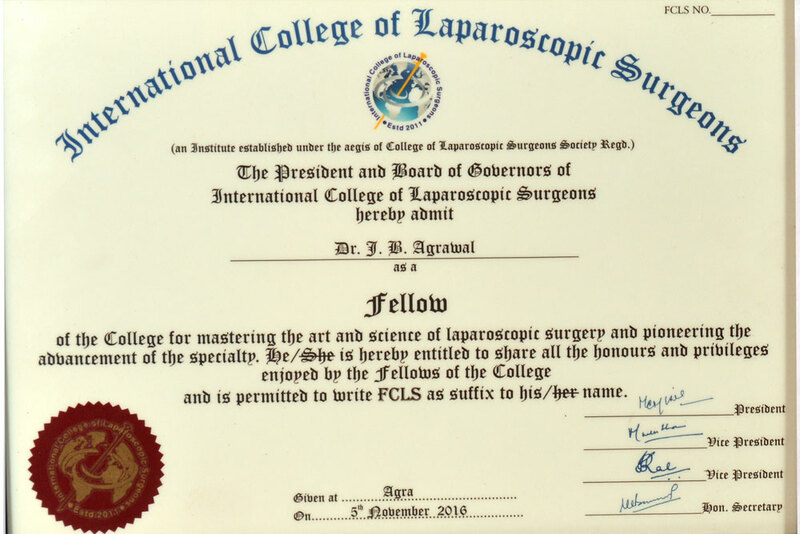 His special interest lies in propagating the advantages of laparoscopic surgery to treat two most common abdominal problems: Gall Stone Disease and Abdominal Hernias. AILS performs the largest number of these two surgeries in India and also holds a Limca Book of Records in extracting the largest gall stone (9cm) by laparoscopic method in 2013. Through the experienced hands of surgeons like Dr Agrawal, Laparoscopic Surgery, also referred to as Keyhole or Minimally Invasive Gastro Surgery has revolutionized patient care. Open surgery involves large incisions of 3-9 inches whereas in Laparoscopic Surgery minute incisions of 3-10 mm are adequate to treat the same condition. Smaller incisions mean minimal blood loss during surgery, low probability of infections at incision sites, no large scars and less chances of subsequent development of hernia. The recovery is relatively painless and discharge is within a day or two as opposed to 4 to 7 days in case of conventional open surgeries. Shorter hospitalization results in savings on room charges, medication etc. Patients can also return to their normal routine and work schedules much quicker as compared to open surgery. Dr Agrawal is of the firm belief that every hospital in India must adopt the practice of doing these two surgeries laparoscopically to enable the thousands of patients who undergo this procedure every year to recover much faster and thereby also contributing to National productivity. AILS offers diploma of laparoscopic surgery of Maharashtra University of Health Sciences (MUHS).